The universe is so big it is very difficult for us to know the full extent of its complexity. We can only scratch the surface of his immensity. This post is going to be all about the findings of neutron stars and their unbelievable density. 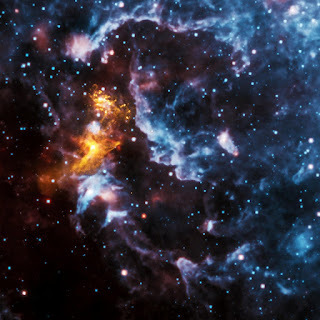 Neutron stars though tiny in direct comparison to normal stars, are truly cosmic monsters with their extremely strange features and therefore, occupy one of the top positions in the list of the strangest celestial bodies. They are remnants of stars that go out at the end of their life and collapse under the pressure of their own gravity. With such an object in the neighborhood, life would certainly not have been able to develop on earth. But more on that later. The matter is so densely packed inside the neutron stars that it is estimated, if you could collect a tablespoon of this matter from the center of this star, then it would weigh about a billion tons or more formally: as many as 3,000 aircraft carriers or 1,000 Cheops pyramids or even our very own Mount Everest. For decades researchers have been trying to find out how big - or rather how small - neutron stars are. Thanks to a satellite and a bit of luck, they now seem to have found a way. The breakthrough is due to the Rossi X-Ray Timing Explorer, which can measure the arrival of a photon with a precision of one millisecond. Had you been an astronaut and decided to go on a journey to this star then? Well, you and your spaceship would be torn apart by the force of attraction and magnetic fields. The landing would be incredibly difficult. These stars are said to rotate several thousand times per second, and many of them have magnetic fields which is ten million times stronger than that of Earth's. That affects you in different ways. First, the magnetic fields of this strength destroy everything that has to do with iron, then your computer systems. In practice, both probably happen simultaneously. The combination of the rotation with the strong magnetic field forms a kind of self-defense system of neutron stars. Do you we are made up of stardust? This may sound ridiculous, but in reality, almost every element found on Earth has been created in the burning core of a star. In other words, all the stuff that makes life on Earth are made of stardust. NASA has intensively studied stardust and you can read more about their research on the official website. So basically, the nitrogen in our DNA, the calcium in our teeth, the iron in the blood, and even the carbon in our apple pie were made inside the collapsing stars. Yes! we are made from star stuff.